Measure the surface temperatures of hot cooking surfaces like griddles, grills, pizza stones, and food in no time with the Infrared Cooking Thermometer. All you have to do is aim and push the buttonit's lightweight and easy to use. The builtin laser allows you to be precise with your temperature readings, and you can get an accurate measurement within seconds. Nighttime cooking is a cinch with the featured blue backlight. You need one of these in your outdoor cooking tool belt. 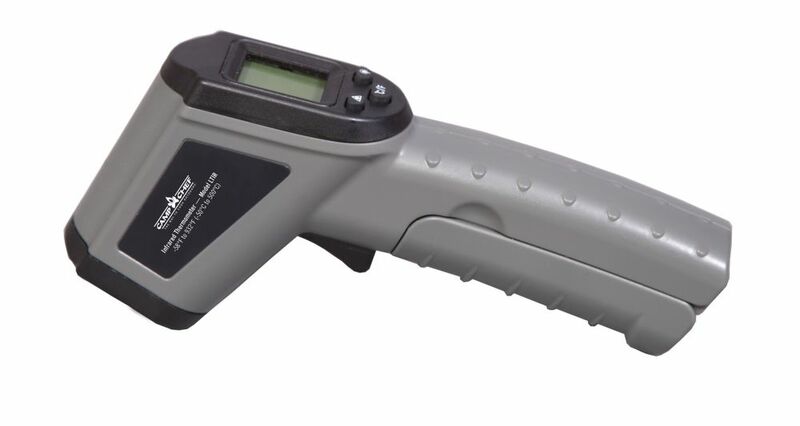 The 42512 is a Dual Laser InfraRed Thermometer. Indicates ideal measuring distance. Choose from 12 in. or 30 in. distance model where two laser points converge to 1 in. target spot. Displays continuous and held data on a white backlit dual LCD display. Complete with pouch case and 9-Volt battery. Make grilling the perfect steak or roast even easier with Napoleon's ACCU-PROBE Bluetooth Thermometer. Use the LCD display to monitor the temperature of up to four separate probes. This Bluetooth enabled device will alert your phone when the food has reached the perfect temperature. The magnetic base means that this BBQ thermometer stays where you put it. Grill steaks and roasts exactly how you want them by setting custom temperatures, ensuring everyone gets exactly what they want. The Napoleon ACCU-PROBE Bluetooth Thermometer comes with two probes and probe markers to know exactly which steak is which. Infrared Laser Digital Thermometer Measure the surface temperatures of hot cooking surfaces like griddles, grills, pizza stones, and food in no time with the Infrared Cooking Thermometer. All you have to do is aim and push the buttonit's lightweight and easy to use. The builtin laser allows you to be precise with your temperature readings, and you can get an accurate measurement within seconds. Nighttime cooking is a cinch with the featured blue backlight. You need one of these in your outdoor cooking tool belt.